Ground speed must be slow enough to allow the air-stream to completely replace the air in the canopy. 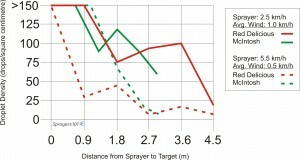 Driving too slowly prolongs the operation and blows spray through the canopy, missing the target and increasing wastage. 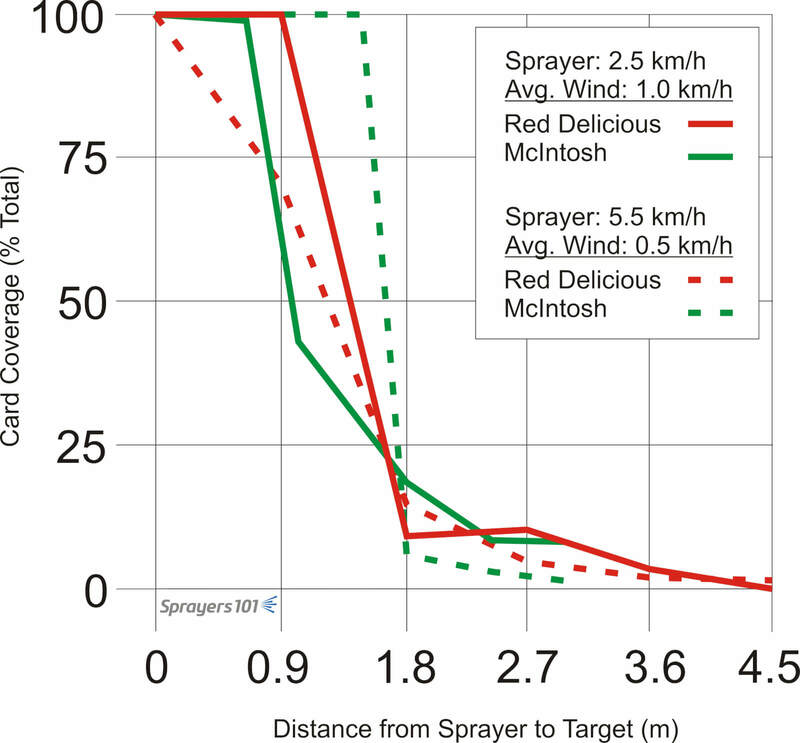 In a 2010 survey of airblast sprayer operators in Ontario, the average ground speed was about 5 km/h (~3.1 mph). Responses spanned from 3 km/h to 7.5 km/h. Measure out a distance of 50.0 m and mark the start and finish positions with wire marker flags. The course should be level. 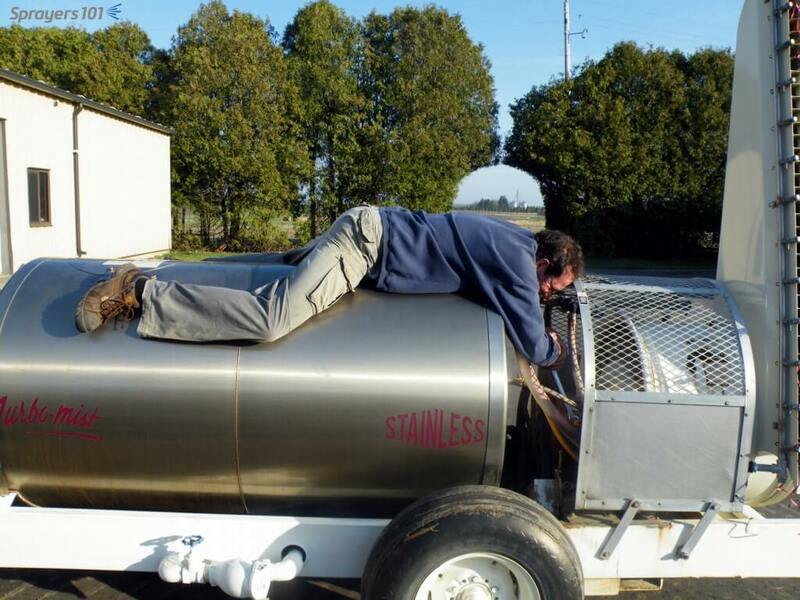 Fill the sprayer tank half full of clean water. 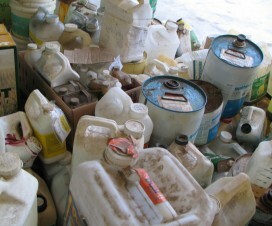 Select the gear and engine speed in which you intend to spray. 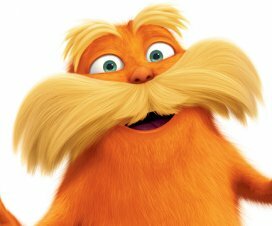 Be sure the fan is going without discharging spray. 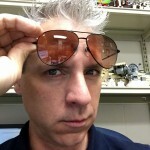 If the PTO isn’t running, it could induce errors. Bring the sprayer up to speed for a running start and begin timing as the front wheel passes the first flag (Easier when there are two people). Stop the timer as the front wheel passes the second flag. Stay out of any ruts and run the course two more times. Determine the average time for the three runs (see example). Spray penetration trials in apple canopies. You might notice there is no tractor cab and the operator isn’t wearing PPE. We were spraying water from a clean sprayer. Sprayer operators are always pressed for time and a common practice is to drive faster to complete the job more quickly. 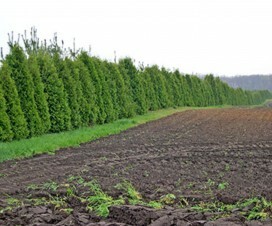 Studies have shown that it takes time for spray-laden air to displace the air in the plant canopy. 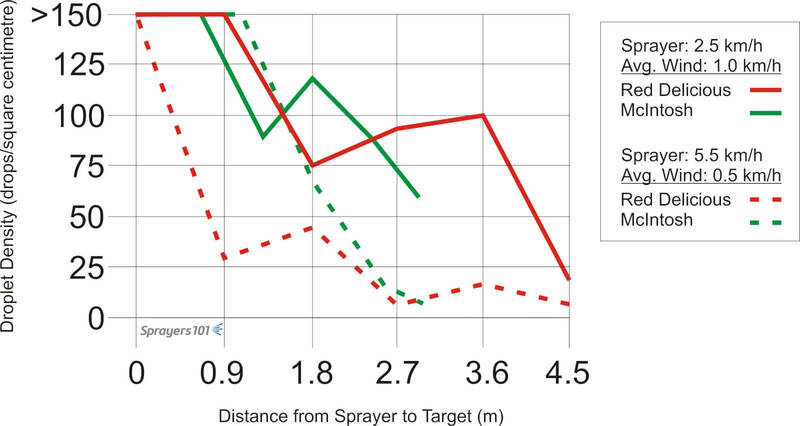 Therefore, lead-footed airblast sprayer operators have been told that slower ground speeds generally improve spray penetration and deposition. Notice that the slower ground speed (solid lines) deposited more drops per cm2 than the faster ground speed (broken lines). Perhaps it’s the human condition that operators need to see it to believe it, even if the experiment has been repeated many times in many other places. 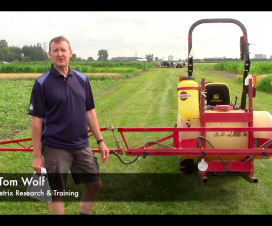 “Sure, that may be true in Michigan, but this is Ontario!” And so, here are the results of some quick demonstration trials performed in Ontario with a 3-pt hitch GB airblast sprayer in an apple orchard. 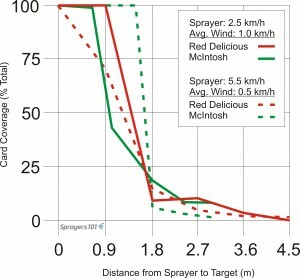 The operator changed nozzle rates to spray the same volume at 2.5 km/h as at 5.5 km/h, spraying from one side of the canopy in light wind. Water-sensitive paper was evenly distributed along the widest part of the canopy, facing the sprayer. The percent of each paper covered (percent) and the droplet density (drops per cm2) was recorded for each position. The result: the slower the ground speed, the more drops penetrated the canopy. 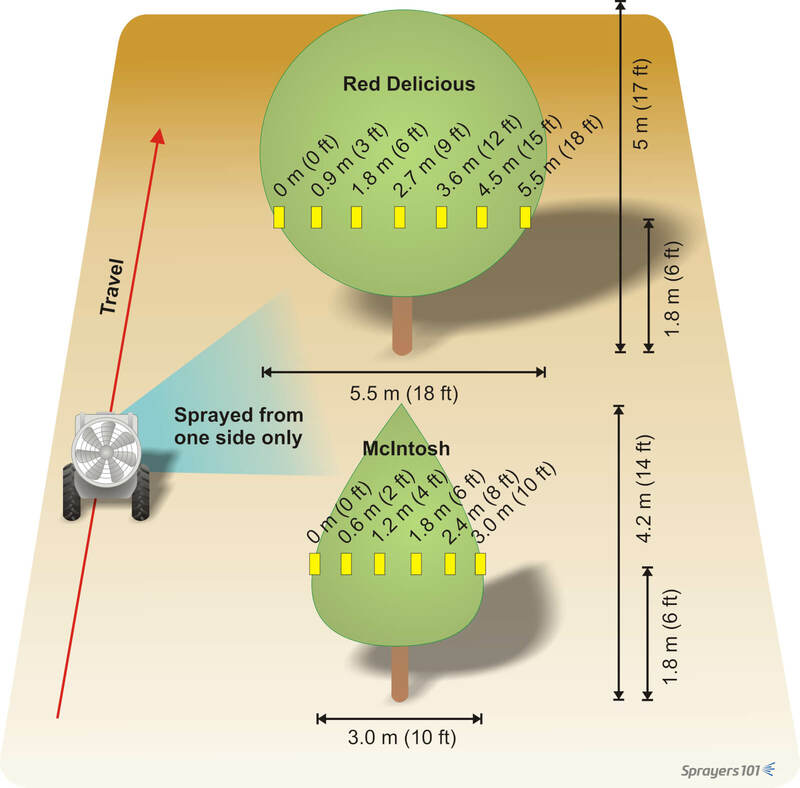 No matter where you live, canopy penetration depends on canopy density, canopy width, ground speed, wind conditions, and the air speed/volume from the sprayer. That’s a lot of factors. Fortunately, their collective influence can be seen using a few 25 cm lengths of flagging tape on the far side of the target canopy. If they flutter as you drive by, great! If they don’t move, or stand straight out, something may be wrong. Many of today’s sprayers have gear boxes on their fans to lower the air speed and volume for early season applications or for smaller crops. If you’ve never tried to shift the gear before, you may encounter resistance. P. Splinter, Ontario, used a lot of WD-40 and a creative position to gain leverage.